Innovation has become a recognized driver of economic prosperity of a country through sustained growth of its entrepreneurships. Moreover, recently coined term open innovation is increasingly taking a lead in enterprise management in terms of sustained profitability. Foci of researchers and practitioners are revolving around innovation methods, processes, and strategies. 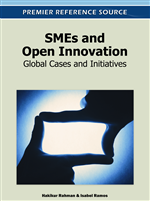 This chapter seeks to find out open innovation researches and practices that are being carried out circumscribing development of small and medium enterprises (SMEs) through a longitudinal study. Along this context the study is investigating into researches that are being carried out by leading researchers and research houses across the globe, and at the same time, it also investigates open innovation practices that are being carried out for the development of SMEs. Before its conclusion, the chapter attempts to develop a framework for future research practices. Innovation is no more just a research topics but became a significant driver for prosperity, growth and sustained profitability to global entrepreneurships). Furthermore, due to opening up the innovation processes and combining internally and externally developed technologies and strategies to create economic value the innovation has crossed the boundary of closed innovation to open innovation (Chesbrough 2003a; 2003b; Rahman & Ramos, 2010), which gained interest of researchers and practitioners favoring special issue of publication, dedicated conferences and growing literature (Fredberg, Elmquist & Ollila, 2008). As mentioned above and also found in contemporary literatures that innovation is shifting from the closed and controlled environment of the corporate entrepreneurs towards more open and flexible model, based on cooperation and coordination among various parties. Knowledge and new technologies are no longer remaining sole properties of major corporations. In this aspect, SMEs are playing important role in networking and making innovation clusters in association with universities and research houses, being recognized as major driving forces in the open innovation paradigm (European Union, 2005). SMEs also play a crucial role in raising investments in R&D and making countries more competitive, which is true for not only the European Union but also in other countries (European Union, 2005). Moreover, the majority of the transitional economies have acknowledged that SMEs are potential engine of economic growth and source of sustainable development, which are essential for industrial restructuring, new job creation, and income generation of the population at large (Koyuncugil & Ozgulbas, 2009). However, as this research has found and being supported by many researchers, utilization of open innovation strategies for the development of small and medium enterprises (SMEs1) remains low in terms of researches and practices (Chesbrough 2003a; 2003b; ; Lichtenthaler & Ernst, 2009; Lindermann, Valcareel, Schaarschmidt & Von Kortzfleisch, 2009; Van de Vrande, de Jong, Vanhaverbeke & de Rochemont, 2008; 2009; West, Vanhaverbeke & Chesbrough, 2006). This study has tried to synthesize researches and practices in this aspect by carrying out a longitudinal study. In doing so, a thorough literature review has been conducted emphasizing researches conducted by leading researchers and practitioners, though hardly these could be recognized as cent percent contribution towards SMEs growth. While investigating into the open innovation aspects of SMEs, the study covered characteristics of individual firms, group of firms or taken at regional or national contexts. The intention is to serve as a basis to commence researches and or practices along the route to enrich knowledge of small and medium scale entrepreneurs cluster among the various business clusters segmented by recognized agencies or institutes engaged in this field of study.